The titles Mr., Ms., Miss, and Mrs. are often difficult for English language learners. And it's something so basic to native English speakers that ESL tutors and ESL teachers often take this for granted. Perhaps, I should speak for myself. I often take it for granted. These titles can also lead to a mini-history lesson about the title "Ms." And even in how to address letters. The two main points here are that for the ESL teacher or tutor, there are lots of ideas for lesson plans, and flexibility is important during a class. Happy New Year! The celebrations never end! This year is The Year of the Ox. We're just leaving my year, The Year of the Rat. As I mentioned last year (I don't expect you to remember! ), Spring Festival is one of the more (if not the most) important traditional Chinese holidays. It's also celebrated by other East Asian cultures and countries. Holidays celebrated by ESL students, and in their home countries, provide great ESL conversation topics. Anything about which ESL students have a lot of knowledge are great conversation topics. People like to talk about things they know about. And there's an added pleasure, sometimes, in teaching another. The task of the ESL teacher or tutor in a conversation class is to encourage the English language learner to talk by asking questions and showing their interest in what the speaker has to say. As the author of this ESL blog, I really try to keep the topics somehow related to ESL, EFL, or English Language Learners and I especially try to be helpful to other ESL tutors and ESL teachers. And yes, Martin Luther King Jr. Day could be used as a conversation topic for ESL classes. This could lead to other ESL conversation topics such as race relations, racism, dreams, homogeneous and heterogeneous nations, American history and culture, "mutts," etc. In short, this day can be the starting point for many conversation and speaking topics in the ESL class. It's up to the imagination of the teacher. However, since this is my ESL blog, I want to take the liberty just to write my own thoughts about this time in my life and in American history. In short, I'm stoked. The inauguration of our country's first African American president is something I never thought I'd see in my lifetime. And for it to follow the day that we celebrate the man who had "a dream" is awesome. While my nation still suffers from inequality in many ways, we have achieved a part of Rev. King's dream. He said, "I have a dream that my four little children will one day live in a nation where they will not be judged by the color of their skin but by the content of their character." We are on the eve of the day when our future president was judged by the content of his character, rather than the color of his skin. Over a year ago I wrote an article called CELTA or TESOL for Private Tutoring. To this day, I continue to get comments from readers criticizing CELTA teaching centers and CELTA in general. Some of the emails have been quite strong and people have taken a significant amount of time to write their lengthy comments. 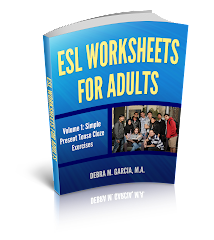 This blog and my site, Teaching ESL to Adults, are primarily for the benefit of ESL/EFL teachers and tutors, so I suppose this information from people who have studied for CELTA certification is useful to pass on to others. And the decision between CELTA and TESOL certification is an important one for the potential new ESOL teacher. While the comments submitted have been critical of CELTA courses, I'm certain that there are many, many people who have had good experiences with their CELTA training. However, it seems to be human nature (or at least MY nature) that we take less time to praise something and more time to criticize. Noteworthy to me is that there have been no complaints submitted against any TESOL certificate training programs. I know for myself, my TESOL training was some of the best training I've ever had and it thoroughly prepared me to start teaching English to speakers of other languages. "I am new to Chapel Hill, NC. I want to return to teaching ESL (I taught at Berlitz in the U.K. many moons ago) and need to know whether I need to be certified, where to start, etc. I would appreciate any advice on what to do first. Thanks!" The requirements for teaching ESL will depend on many factors, such as where you want to teach, the type of institution, students, etc. Please read my page on How To Start Teaching ESL to get more information to start teaching ESL. As a self-employed ESL tutor, I have several "small offices" all over my city. To some, they look like coffee shops. In fact, they are. I have different "offices" for each part of my self-employed life. I meet my private ESL students at one particular coffee shop that is convenient to public transportation and local colleges (to make it easier for my students who are traveling or meeting me before or after classes). The coffee shop doesn't mind me sitting and meeting with students for hours on end. They also have the right size tables and decent chairs. However, amazingly, they don't have internet access. I guess people would never leave if they had internet access. I'm currently in another one of my "offices." In this office, I work on my website (Teaching ESL to Adults) and other projects requiring internet access. I wish all my ESL students past and present (and all blog readers) a happy, prosperous and safe 2009. With so much violence going on in the world right now, it's hard to focus on the good things, on the hope so many of us have for this coming year, for the world, and for Americans, for our country. I don't have any suggestions for focusing on the good things. But I do know from past experience, that life goes on. For ESL teachers and tutors, students will still come to us with a desire to learn and improve their English. We will still take time to prepare lesson plans. We'll still look for ways to help our ESL students learn. 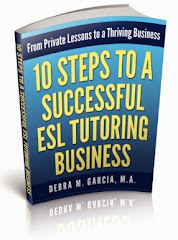 Private ESL tutors will continue to look for new students. Teachers in public and private schools will continue to be underpaid. Life goes on. May we all experience hope this year, and love and prosperity and happiness.